RadioShack Corporation is closing stores to try to stem the company's big losses -- but it's too little, too late. Earlier this week, RadioShack Corporation (NASDAQOTH:RSHCQ) announced that it plans to close up to 1,100 stores this year. That represents about one quarter of the company-owned store base within the U.S.
RadioShack's drastic decision is pretty sensible in light of the company's dismal earnings trajectory. Revenue declined more than 10% in 2013, to $3.4 million, leading to an adjusted net loss of $305.8 million. However, the company is so far from reaching profitability now that even store closures and an aggressive turnaround plan are unlikely to save the company from bankruptcy. RadioShack's fall has been fast. As recently as 2010, the company was solidly profitable, and shares were trading for more than $20. In the last two years or so, RadioShack's losses have rapidly mounted, sending the stock to a multi-decade low of $2. Even as RadioShack's profitability was plummeting in 2011 and 2012, the company's significant tangible book value represented a potential windfall for shareholders. As RadioShack shares dipped toward $2 for the first time in late 2012, the company was valued at less than 40% of its tangible book value. Since Radio Shack had (and still has) fairly modest lease obligations, it seemed that management could unlock value for shareholders by downsizing the business -- or even shutting it down entirely. With tangible assets outnumbering liabilities by $562 million as recently as the end of 2012, there seemed to be plenty of value for investors even if RadioShack didn't have a long-term future. 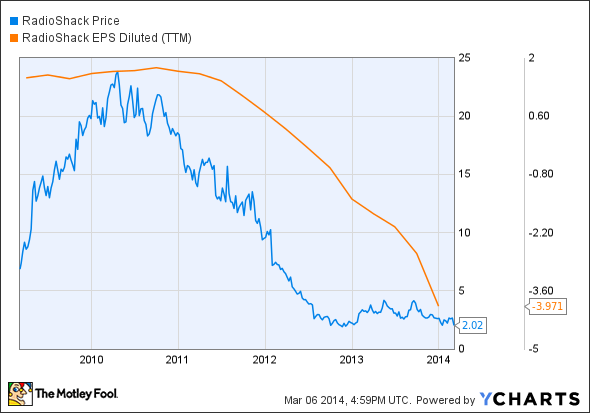 Fast forward to today, and RadioShack has destroyed all of that shareholder value. By the end of 2013, the company's tangible book value had dropped to less than $200 million. The primary culprit was RadioShack's big 2013 operating loss, but ill-advised share buybacks undertaken while RadioShack stock still traded for more than $10 also hurt. Because RadioShack's tangible book value has all but vanished, the only hope for shareholders is a full-blown recovery. While not 100% impossible, this scenario seems very far-fetched. Last year, RadioShack posted an adjusted loss of more than $300 million on a revenue base of just $3.4 billion. Even if store closures and other initiatives allow RadioShack to slash its operating expenses by 20%-25%, the company will still need significant comparable-store sales growth to drive a return to profitability. Even comparable-store sales growth may not be enough. While RadioShack has touted its new concept stores as "a significant advancement in technology retailing," management was evasive when asked about the profitability of these stores on the company's recent earnings call. This led analyst Scott Tilghman of B. Riley to surmise that these stores are also losing money. Even if these concept stores have higher revenue than the company average, investors shouldn't get too excited until they start covering their costs. RadioShack's new leadership team is making a strong effort to revive the storied retailer despite the secular headwinds facing much of its business. However, RadioShack's losses are so deep, and the company has burned through so much of its tangible book value in recent years, that it probably won't matter. RadioShack executives assured investors this week that the company has adequate liquidity to get through 2014, but that's not especially comforting, because any return to profitability will likely be years from now. RadioShack's chances of avoiding bankruptcy seem slimmer than ever.